The Truth and Reconciliation Commission of Canada (TRC) held its closing events in Ottawa from May 31 – June 3, 2015. The event included the release of an executive summary of the TRC findings and Calls to Action made by the Commission. The 388 pages of the summary highlight the work of the Commission and the material which will be included in the final six volume final report. Though this post focuses on the TRC’s discussion of museums and archives I urge everyone to read the full executive summary as it provides crucial context and historical background. Chelsea Vowel’s call to read the entirety of the report highlights why it is so important to read the report before commenting on the work of the TRC. For those looking for a more accessible version of the summary Zoe Todd, Erica Lee, and Joseph Murdoch-Flowers are crowd-sourcing readings of the report on Youtube and the summary has been converted into a Kindle format and epub formats. The report features 94 recommendations to facilitate reconciliation and address the legacy of residential schools, including a set of recommendations relating specifically to museums and archives. Given the challenging past relationship between the TRC and archival institutions these recommendations are perhaps not surprising. The TRC went to court in 2012 and 2013 to gain access to archival records relating to residential schools held by Library and Archives Canada. The Commission’s recommendations go beyond the issue of access. It also includes calls to action relating to best practices, commemorative projects, public education, and compliance with the United Nations Declaration on the Rights of Indigenous Peoples. In terms of public education and commemorative projects the Commission urges the federal government to work with Aboriginal peoples and the Canadian Museums Association to establish funding for commemoration projects for the 150th anniversary of Canada relating to reconciliation. It also calls for Library and Archives Canada to commit additional resources to education and programming on residential schools. In 2010 the Shingwauk Residential Schools Centre, where I work, began a process of professionalization which included the development of many policies relating to collection care, access, and display of items relating to residential schools and Indigenous communities. The SRSC is jointly governed by Algoma University and the Children of Shingwauk Alumni Association, a survivor organization. This indigenous oversight has been crucial in developing respectful policies. On a personal level I have continuously learned by listening to the words of elders whose history is held in the SRSC. During the policy development phase I remember scouring the internet for policy examples which took into account Indigenous intellectual property rights, cultural traditions, and care of sacred objects. I found many helpful international examples. But Canadian examples were few and far between. An optimist might suggest that perhaps the Canadian policies simply weren’t accessible online. Maybe that’s true. But my gut says that the archival and museum profession has a significant amount of work to do in policy development and collaboration with Indigenous communities. There are some heritage organizations that have done amazing work with First Nation, Métis, and Inuit communities and who have incorporated the museum specific recommendations made by the 1996 Royal Commission on Aboriginal Peoples into their policies. But this has not yet become the norm across Canada. Last year I remember visiting a small rural museum and being appalled at a display of early settler artifacts that inserted First Nation made artifacts into the exhibit in a way that belittled and dehumanized the work of First Nation people. Sadly this isn’t a onetime occurrence. Canadian museums of all shapes and sizes have had a poor track record in their collaboration with Indigenous people. The controversy around the Canadian Museum for Human Rights is one of the more recent national examples of failure to tell the complete truth and include indigenous voices in the historical record. Former CMHR curators have spoken out about being told to limit the content on missing and murdered indigenous women, downplay the role of child services, and avoid using the term genocide. Archives also have a crucial role to play in the preservation of a representative and accessible history of Canada. Holdings need to be described in a way that is respectful to Indigenous worldviews, Indigenous people have a right to access material created by and written about them, and that access should not involve insurmountable barriers. Archives play a crucial role in ensuring all sides of the past are documented and archivists need to look at their practices to ensure Indigenous voices are being preserved in a complete and respectful way. Archives and museums which hold material created by Indigenous people or who create exhibits on the history of Indigenous people need to look toward better models of collaboration. Not simply token collaboration which sees an elder opening meetings but collaboration which involves First Nation, Métis, and Inuit people in a meaningful and respectful way. The creation of best practices and guidelines for archives and museums that are developed at a national level would be a huge step forward in the heritage field. I hope that the heritage profession at large takes heed of the TRC’s words and thinks carefully about how it can help work toward reconciliation. Great post, Krista. You probably already know about these Canadian examples of collaboration with Indigenous peoples, but I wonder if the Glenbow and UBC’s Museum of Anthropology are helpful to you as models? MOA, the Museum of Vancouver, and the Musqueam Culture Centre have partnered to produce an exhibit that Susan Roy was involved with; :”c??sna? ?m: the city before the city.” Working in an archives yourself, you are more than aware of the financial and other constraints museums and archives work under, particularly small ones that often rely on volunteer labour. I wonder if you have thoughts about what’s required to realize your vision of collaboration? Thanks for your comment Tina. You’re right, the Glenbow and UBC’s Museum of Anthropology are great models. I hadn’t heard of the “c??sna? ?m, the city before the city” exhibit, it looks like a great project. I’m not sure that I have the answer to what needs to be done to facilitate more collaboration. But, I think in a lot of cases organizations aren’t sure where to start. They might want to work collaboratively with a local Indigenous community but aren’t sure how to make that initial connection. Having professional organizations on board which present models of successful partnerships and guidelines for working with Indigenous communities might help with this. Re-framing the concept of historical narratives is also important. Local history has long been the bread and butter of community museums and archives. But Indigenous history is rarely integrated into the local narrative in a meaningful way. I think there is also a need for cultural competency/sensitivity training in the heritage professional as a whole, especially for those working in organizations who hold items created by Indigenous people. At smallmuseums.ca we’re starting to develop some travelling exhibitions relating to indigenous experience, including some pretty harrowing residential schools stories. We’re actively looking for partners and venues, so please get in touch if you’re interested in working together. Sad to say that you misrepresent the ROM with the image included in this post. 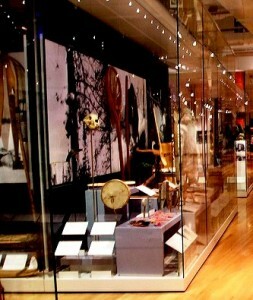 Visit this gallery today & you will see only a disgraceful display of Aboriginal material culture that visitors can barely see through absolutely FILTHY glass on the display cases that have only been further smudged by slap-dash attempts at “cleaning” in the past 2 years. Your image patently is many, MANY years out of date. The ROM First People Gallery currently is a disgrace to the people it portrays & the ROM demonstrably could not care less about how they represent First People so carelessly. The ROM’s First People’s gallery in its current iteration should be shamed, not used as an exemplar. Graham – Thank you for sharing UBC MoA’s Reciprocal Research Network as an excellent example of an effective collaborative research initiative. It’s great to see such important resources being shared and so many different communities being included. If anyone else has examples of successful partnerships or collaborative community based projects please feel free to share them in the comments.